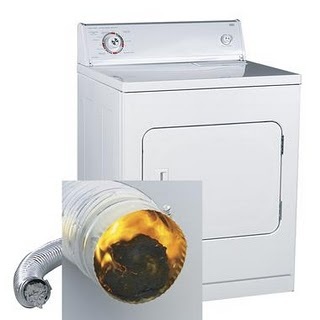 You probably have heard it a million times: the buildup of lint in a dryer vent can cause a fire. So you religiously clean out the lint screen after each load of laundry and think that you’re avoiding the risk. The reality is that while you are reducing the risk, you’re not eliminating it because those lint screens are only catching roughly 25% of the lint. The remaining 75% goes into the dryer vent and sticks to the walls. The U.S. Fire Administration (part of FEMA) cites that there are 2900 home clothes dryer fires every year resulting in an estimated 5 deaths, 100 injuries, and $35 million in property loss. And the leading cause: failure to clean them. Could you have a hidden danger in your home? Periodically check while the dryer is operating to make sure that the air exhaust vent pipe is not restricted and the outdoor vent flap will open. To remove a blockage in the exhaust path, it may be necessary to disconnect the exhaust duct from the dryer. Remember to reconnect the ducting to the dryer and outside vent before using the dryer again. Have qualified service person clean lint out of the pipe once a year to minimize the amount of lint accumulation. 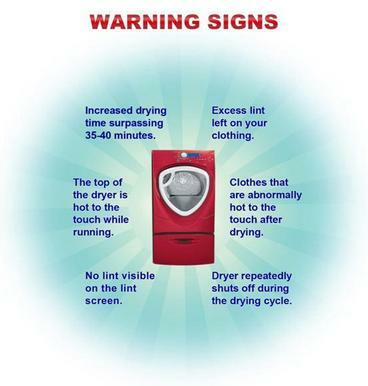 Keep the dryer area clear of combustibles like boxes and clothing. Length: The longer the dryer hose, the more chance for lint buildup. The more chance for buildup, the greater risk of fire. Check the specifications on your dryer; it will quote the maximum distance for your duct/hose. Also, check your town code requirements. (They tend to range between 25′ and 35′ maximum.) But “the shorter the better” is the rule to follow. Bends: Every bend is the equivalent of adding additional feet to your dryer hose. (We read different numbers: every bend adding the equivalent of somewhere between 2.5 and 5 feet to the risk because as you can imagine, bends catch lint!) Combine that with the information above about duct length when you’re planning where to place a dryer in your home. Material: Use METAL DRYER DUCTS. Flexible dryer ducts made of foil or plastic can sag and let lint build up at low points. Ridges can also trap lint. Metal ducts, either flexible or solid, are much safer because they don’t sag, so lint is less likely to build up. Plus, if a fire does start, a metal duct has a greater chance of containing it. Cleaning: Clean the duct regularly. You should also clean inside, behind, and underneath the dryer because lint builds up there as well. These hazards can be avoided by having Northern Duct Services thoroughly inspect and clean your dryer vent every year. We’re here to help you protect your home and your family from this hidden hazard. Plus, you’ll enjoy the additional advantages that your clothes will dry faster, you’ll use less energy, and your dryer could potentially have a longer life! Please Call and have your dryer vent cleaned by Northern Duct Services to help protect your most important possessions, the lives of your family!